Austin Water conducted a Cost of Service (COS) rate study of its water, wastewater, and reclaimed water rates in 2016. The process entailed a comprehensive review of the methodology used to allocate costs amongst customer classes and to update and improve the methods for determining fair and defensible rates of utility services. 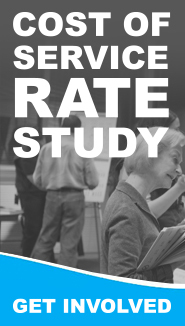 The rate study included extensive public involvement from our retail and wholesale customer class committees and the public. This process will be followed by an Impartial Hearings Examiner review. These two components will provide our customers, community, and commissions a comprehensive opportunity to participate in our rate development process. This will also provide our City Council with significant public, rate advocate, and consultant input as they make decisions on future rates. To learn more about the IHE process and how to participate visit the Austin Water Rate Review website (link coming soon).